When it comes to the Islamic welfare state, the first thing we need to recognise is that this is a neologism (a newly coined word or expression). This word has not really been used. The Holy Prophet Muhammad (PBUH) never had a word that would approximate to this. It’s not just the welfare part which is new, it’s also the word “the state”. There are three conceptual components of the “Islamic welfare state”. There is “Islam”, there is “welfare” and there is “state”. It is up for dispute whether Pakistan as a state even approximates the Madinan state in any fair way. If you look at the history of states and politics, then Madina is best characterised as a “city state” which is not what Pakistan is now. It is now one of the world’s biggest states; there is a big difference in scale. That’s a big asymmetry. Then, secondly when you talk about state, there was no developed form of Shariat—you had the Shariat-Giver present within Madina itself. This is a big difference. Now we are obviously debating what was his legacy. Those kinds of disputes would not arise in the Holy Prophet’s (PBUH) time. The disputes that would arise would basically be over strategic issues, tactical issues or technical issues but not over what is God’s Law. That is very much in our times. And in Pakistan’s history, [everyone] knows and I don’t need to go into it here, but these debates are [taking place]. But I think the most interesting thing is the welfare concept and the Islamic welfare state issue. Welfare, as it is used now, as far as I understand, is that this idea developed in the post-WWII time period. It took hold as a reaction within the West to the kinds of claims that Soviet Communism was making about runaway materialism, runaway exappropriation, runaway monopolisation, made possible by Capitalism. Within western Europe, the idea was developed that you need to have a state which will not only protect the borders, manage the economy but will also provide the social welfare and security net for your disadvantaged citizens. So, to take the example of the US, because that is the one that most people are familiar with in Pakistan, you’ve got the development of something that is known as “social security” or different kinds of health insurance programmes for the elderly and the poor. That is sort of a minimalist conception of what the welfare state will do. It will look after the disadvantaged, the elderly. But who exactly would a welfare state target? Would the welfare state, for example, include universal education? Is that something that should be included in it? Different states in the world who have different conceptions of a welfare state have taken different positions on this. Now, if we were to apply these debates, and these debates are very complicated, to Pakistan, the issue would be over here that Imran Khan needs to set down what he exactly means or the PTI needs to set down what they exactly mean by the welfare state. What kind of welfare do they have in mind? One could easily say an Islamic welfare state must prioritise the welfare of Muslims over the welfare of non-Muslims when they clash as opposed to maintaining a generic concept that the poor will be provided for. The dominant understanding here is that welfare is economic benefits, but one can easily expand this language and include within welfare our sense of honour, because that has been exactly what has been happening in Pakistan for a long time. The state has been construed by some sections of the population as a defender of Islamic values. 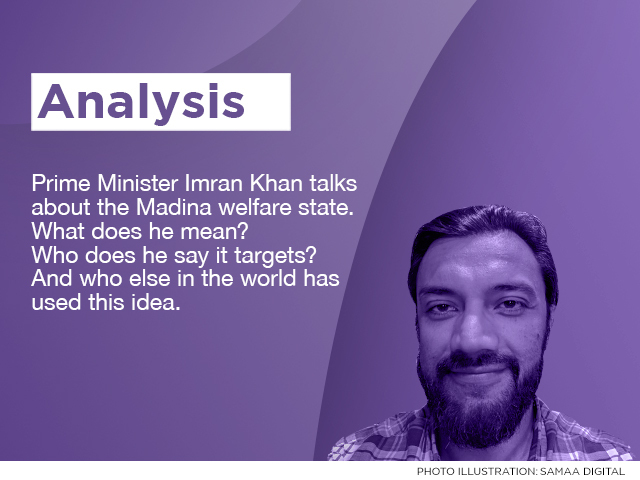 While Imran Khan’s rhetoric on the Islamic Welfare State may be giving rise to a different way of conceptualising economic rights in Pakistan it might also provide a cover for the old kind of concerns, whether for good or for bad—for them to be pushed forward in a new guise. That’s why he needs to be very clear on what he means by this. We should constantly ask Imran Khan to be clear—but I think he has a purpose in not being clear on these issues. It serves multiple bases. The Jamaat-e-Islami kind of people who he has absorbed into the PTI, not just in the party but from the population, they will obviously like this kind of [talk]. It rings a bell in their head, that kind of reminds them of Maududi-esque issues. But at the same time he can appeal to people the urban literate population, who, while not invested in the Jamaat-e-Islami kind of Islam, are interested in how Islam is being or is going to be promoted and the language of Islam and the rhetoric of Islam that is going to be used to protect the disadvantged in the community. The bigger issue is (concepts aside) what exactly will the welfare state do in terms of economics in order to create this kind of huge safety net? Because we still have tax-payer issues in Pakistan and we still don’t have enough of a surplus in the economy to even properly service our debt, forget being able to create a social welfare net. I would say that is the biggest angle that needs to be looked at. Let’s look at the global situation where other states use this language. The closest you will get to it is in Turkey with a huge populist base where the Justice and Development Party (Erdogan’s party) has maintained this rhetoric that Imran is doing. But even if you look at that trajectory there [in Turkey], you see [Erdogan] comes on the crest of huge populist support. And slowly and gradually while his anti-Western stances have been pretty clear and good for the most part because he is speaking out for a lot of Muslim issues in the world, some commentators say that he is riding this wave for his personal benefit and consolidation of power. So if I were listening and following Imran Khan closely that is another thing I would be watching out for. This rhetoric makes you popular with Muslims at so many different levels that it also generates a certain kind of free pass for you. Omar Shaukat is pursuing a PhD in Religious Studies from the University of Johannesburg, S. Africa. He has an MA in Religious Studies from the University of Virginia. He most recently taught at IBA in Karachi (‘History of Ideas’ and ‘Socioeconomic Philosophy of Islam’). He has worked at the Afro-Middle East Centre in Johannesburg, South Africa where he focused on ISIS, the Syrian crisis, Islamist politics. He maintains an interest in social movements in the Muslim world.